In the past seven months, the team at the Sarjeant have inventoried and packed over 6000 artworks as part of the relocation of the collection to 38 Tāupo Quay. 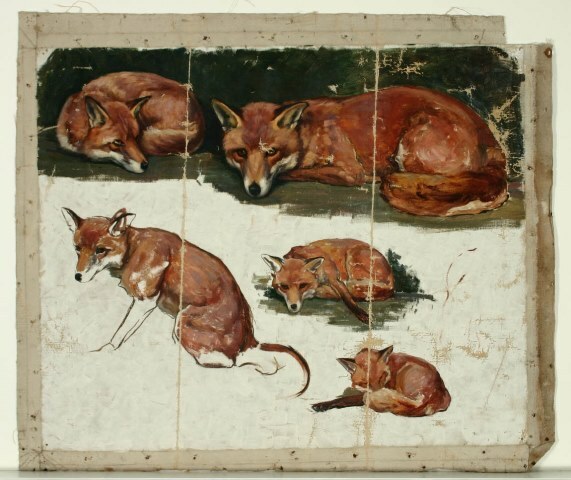 Of the many items that I have been fortunate enough to work with in recent months, one that particularly caught my attention was a series of five studies on canvas of a red fox painted by Violet Emily Whiteman (née Sells). What struck me most about the painting was how the artist had taken an animal traditionally associated with the wild and presented it with such obvious affection. The creature’s restful posture, the non-descript background, and Violet’s careful observation of its features and expressions all contribute towards a sense of intimacy. 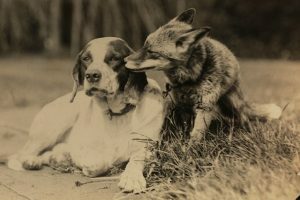 Research into the artist and her subject provided the explanation: this was not a painting of just any canine but a beloved, if somewhat unusual, member of the Whiteman family named Teddy Fox. The painting of Teddy is one of many animal portraits that Violet created throughout her long career as an artist. 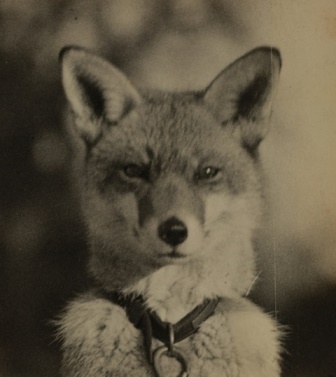 Born in 1873, in Guildford, England, Violet developed a love of animals at an early age. Among her childhood companions were ponies, dogs, and later horses, which she began to paint and draw. Violet furthered her skills as an artist by studying at the Herkomer School in Bushey, as well as taking lessons from noted animal painters William Frank Calderon (1865-1943) and Stanhope Forbes (1857-1947). In 1905 Violet married William Whiteman and the couple moved to a stud farm in Herefordshire where they raised two sons, John (b.1906) and Archibald Jenner (b.1908). Known as ‘The Hyde’, the property was also home to a variety of animals including cattle, horses, some pointer and setter dogs, and for six years, a vixen called Teddy. 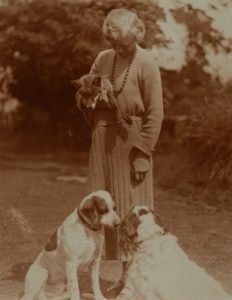 Photographs taken at The Hyde during this period show Teddy spending time in the garden with the dogs, whom she also reportedly joined by the fireside in winter. A close relationship with Violet is also indicated with several pictures showing the artist holding Teddy in her arms. Photographer unknown, Violet Whiteman with Teddy and two dogs, date unknown (early 1920s?). Collection of the Whiteman family. In 1926, Violet and William immigrated to New Zealand, settling in the Whanganui district. Although Teddy couldn’t make the journey, archival records suggest that multiple pictures of her accompanied Violet out to her new home. In 1944, two portraits of Teddy were included in an exhibition held at Miss E J D Turner’s studio on Victoria Avenue. A watercolour study that is today held by her family may be one of the works that was shown at this time. A further painting, this time depicting a vixen and her cubs, was shown as part of a retrospective exhibition held by the Wanganui Arts Society in 1975 to celebrate its 75th Jubilee. The painting of Teddy in the Sarjeant collection was gifted to the Gallery in 1994. It is among 19 works by the artist that have entered the collection since 1928. Looking at the work it is clear that it started its life on a stretcher or strainer (a wooden frame that holds a canvas taut). Prior to its acquisition by the Gallery this element was removed and the canvas was folded in two places resulting in damage to the paint surface. Despite this, the painting remains a beautiful example of Violet’s work and offers rare insight into her artistic process. As a result of the relocation project the work has now been re-housed in a custom-built box that keeps the canvas flat and well supported, helping to preserve the painting for future generations of animal lovers to enjoy.